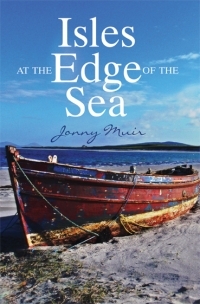 With 96 days to go to publication and some eight months after I commenced writing, Isles at the Edge of the Sea is, at long last, completed. I sent the manuscript – all 71,000 words of it – to my publisher, Sandstone Press, today. It has been a labour of love, but not always – at times it has been frustrating and fraught with confidence-crumbling moments. The writing process is inescapable. It is always there, at the back of your mind, a nagging knowledge that work, a gigantic amount of work, needs to be done – and done well. For so long, the script has been my personal possession. Of course, I always knew that the whole point of writing was for public consumption, but that moment of handing it over – opening it up for mainstream scrutiny – is a fearful one. My mother called earlier, in tears, after reading the last three chapters. Good tears, I hasten to add. She liked it, I like it; I just hope others do too. Great news looking forward to reading that!